Bearing trouble-free with the adoption of the metal-less system: Intermediate and main metals are no longer needed. Low vibration and stable continuous operation. Suction depth (Length L) can be extended by adding an extension suction pipe. (However, the Starting pit level should be above the impeller). Electro-deposition and general paints Transport. Gypsum and Phosphoric Acid Slurry Transport. Transportation of fluid with slurry in Steelworks, Refinery, and Cement Industry. Slurry handling in Coke Factories and Chemical Industry. Transport of high temperature liquid including slurry besides sulfur. Transport of mixed liquid slurry Applications. For cast-iron material the pump model is VNF. SCS23, Nickel, Worthite and Hastelloy. 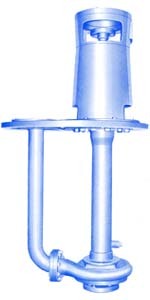 Length can be extended by adding supplementary suction pipe only when the Starting liquid level is above the impeller.